including electricity up to 50 kwh / week (extra consumption must be paid extra = 0.25 € / kwh). Two weeks before arrival it must be payed the guarantee of 200 € per bank-transfer (its refunded on departure in cash). The Villa Japon in Moraira is a wonderful holiday home. Very close to the center of the village and to the sandy beach. 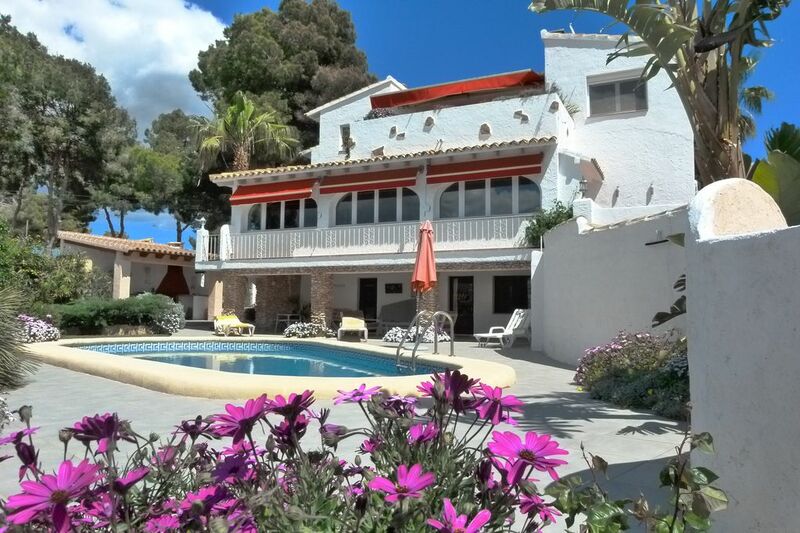 Located in Moraira - Pla del mar. This comfortable villa offers you a relaxing vacation in any season. For rent is the apartment upstairs and the ground floor: there are 2 living levels, which are very generously divided (about 180 square meters Wfl). Both levels are connected by an internal staircase. 1 large living room with open american style kitchen (with dishwasher) and dining room (with exit to a balcony with sea view and to the other side exit to the barbecue area and pool); 2 bedrooms (each with air conditioning) and 2 bathrooms. From the hallway you can reach about an internal staircase to the ground floor, where a studio with bed-room (with fan) and bathroom en-suite is located. From this room you have direct access to the pool terrace. The garden is beautifully landscaped with palm trees and other rich flowering plants; with many flowers, oleanders and other mediterranean bushes. A place to relax and enjoy. There is a shaded covered terrace and a sun terrace right by the pool. In addition, the tenants have a cozy barbecue area with brick barbecue and seating available. The pool is for exclusive use for the tenants. The private atmosphere is completely guaranteed. There is another apartment in the attic, which is inhabited all year round (helpful for questions and tips). However, this apartment has the entrance on the back of the house. One they have sometimes contact with this apartment if they occasionally meets in the parking lot. The garden part of the tenants is closed by a wall, so that from the parking lot it has no insight on the pool. There is Internet connection via Wifi and a large covered parking space (for 2 cars) - with electric gate. The location is very central; The village, sandy beach, restaurants and shops are within walking distance. Only families with children are accepted; or couples over 25 years (no groups with singles). Dog keeping is not possible. Wir haben uns sehr wohlgefühlt. Unser Vermieter hat uns gut betreut; mitgenommen zu besonderen Orten und Attraktionen ....alles in allem uns die Abreise schwer gemacht. This is rightly called the Pearl of the Costa Blanca. It is a friendly, quietly located old fishing village with little in the way of mass tourism and a picturesque marina. incl. Bettwäsche (Handtücher müssen selbst gebracht werden). inclusive Strom bis 50 kwh/Woche (Mehrverbrauch muß extra bezahlt werden). In bar bei Anreise muss eine Kaution von 200 € hinterlegt werden. Diese wird in bar bei Abreise zurück erstattet.